FLORIMI, M. / ARNOLDO de ARNOLDI - Hungaria. Map maker : FLORIMI, M. / ARNOLDO de ARNOLDI. Size : 14.2 x 17.2 inches. / 36.0 x 43.7 cm. 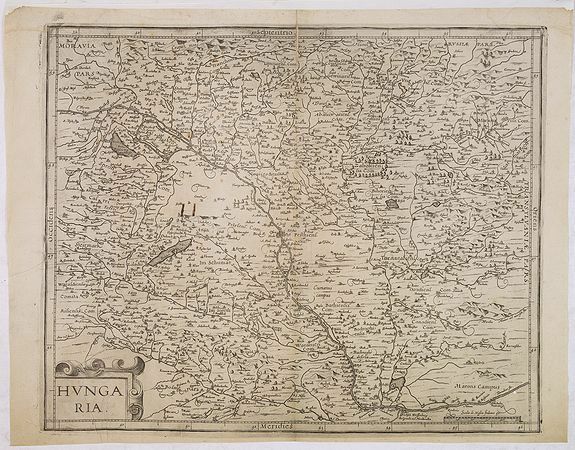 Description :A very rare map of Hungary by Matteo Florimi ( fl.1580-1612) who was active in Sienna as an publisher and is perhaps more famous for his town views than his maps. Most of his maps are engraved by Arnold Scherpensiel, who was calling himself Arnoldo de Arnoldi, he was a Dutch engraver, who worked for Florimi from 1600 -1602. The map is copied after the standard map by Gerard Mercator. A late follower of the Lafreri school. Tibor, S. Descriptio Hungariae, 88. Szantai,L. Atlas Hungaricus, Florimi 1, vol.1, p.184. Condition : Paper slightly browned, as usual. Repair of a 3cm. worm trace, and a one cm. in center of map. Split in upper part of centerfold, 3cm. into engraved area. VERSO: "Hungaria" in contemporary brown ink, ink affecting the paper at one place. Upper margin extended with a binders stip. A paper strip pasted on the verso. A good and strong impression.